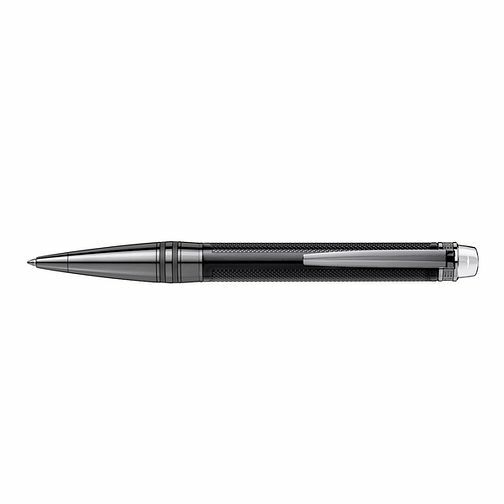 From the exquisite Montblanc stationery collection, this StarWalker Extreme ballpoint pen features a sleek black resin case with diamond cut detailing, ruthenium-plated fittings and nib, and topped with the brand's white star emblem. Stylish and comfortable to use, this elegant pen beautifully celebrates the art of writing. Montblanc StarWalker Extreme ballpoint pen is rated 3.0 out of 5 by 2. Rated 1 out of 5 by Anonymous from Product returned after 1 week Dark silver finish started flaking off in 2 places after 1 week. Didn’t want to risk another in case the same happened to that. Rated 5 out of 5 by Anonymous from Gorgeous masculine pen! The recipient of this pen, given as a gift for long service at work, was over the moon. It is great quality and lovely to write with. He uses it to get contracts signed and now calls it his lucky pen as it is working brilliantly! Highly recommend this product for look, feel and quality.